First published in 1984, this collection represents the combined contributions to an international conference held at the University of Bristol in April 1983. In assessing the complex relationship between education and development, it covers a wide range of countries in its appraisal and presents pictures both of optimism and pessimism. All, however, encourage the reader to re-examine long-held beliefs, and presents a new starting point for fresh discussion of this vital subject. 1. Eco-Paedagogics and the Commons 2. 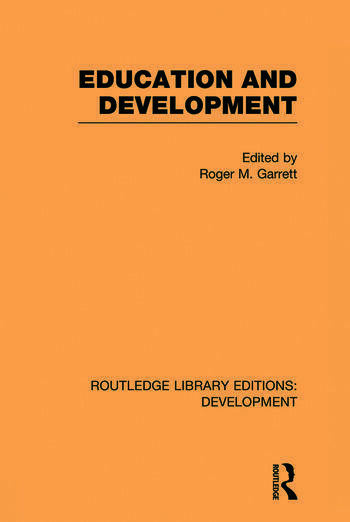 Tomorrow is Already Today: Development Education and the new 21st Century Paradigm 3. The Contribution of Education in the United Kingdom to National Development and International Education 4. Institutionalisation of Research in Chile’s Universities: 1953-67 5. The Political Economy of International Co-operation in Educational Development 6. Curriculum Change for International Awareness 7 . Problems Associated with Vocational Education in Less Developed Countries 8. Primary Schools and Rural Development: The African Experience 9. Distance Education: Panacea or Peril 10. Making Tomorrow Happen Sooner: Towards a More Equal International Exchange of Students, Teachers and Research 11. Schooling as an Obstacle to Development in Zambia 12. Identity and Reform: The Effects of Military Government on Education in Brazil.